These highly efficient industrial motors provide longer run times and use less battery capacity than hobby motors. 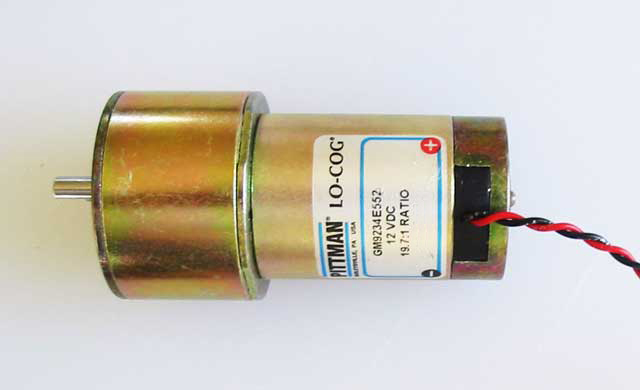 These motors are rated at 20 watts continuous power. They are capable of producing over 50 watts of usable momentary power. The 15.1 volt armature windings are the perfect compromise for robotic applications and traction motor systems running between 12 and 24 volts. The all steel gear drives are rated at 175 oz-in. of continuous torque at 200-300 RPM. You can't get torque and speed performance like this from plastic hobby servo motors. The motor shafts are 1/4 inch stainless steel with extra long flats that allow the use of a wide variety of gear, sprocket, and pulley options. These motors are designed to accept standard industrial components, not proprietary plastic toy drive parts. KT Torque constant 3.29 ounce inches/ampere or 0.0232 Newton meter/ampere.